More vegetables and stir fry! I tell you, I am loving my wok right now. Of course, you don't need a wok to make stir fries, but I do think the wok gets the job done that much better. That might just be because I happen to have one and am finally comfortable using it, but I do think it makes a difference.. 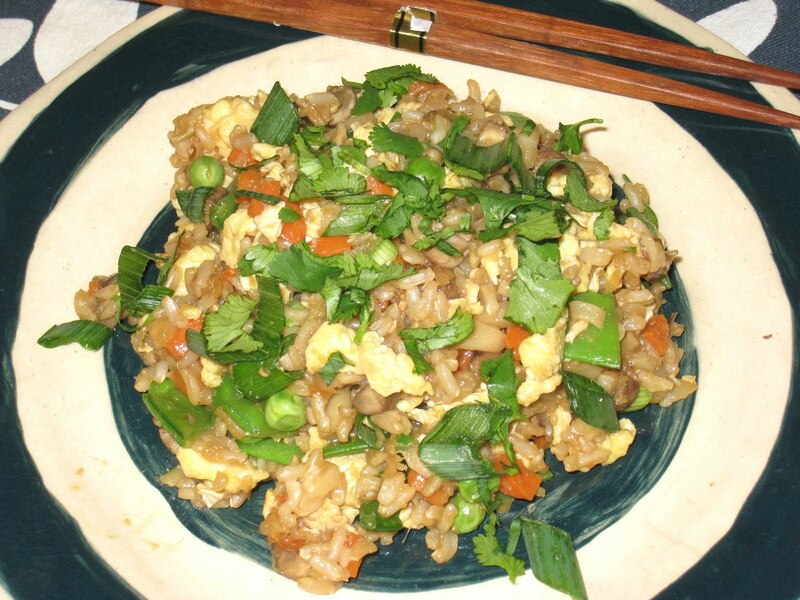 Many years ago, my father got his hands on a recipe for Fried Rice and decided to try his hand at it. It was delicious, but in my memory it was a long, complicated process, although looking at his recipe I see that it is not at all complicated. We did not have a wok (nor would we have known how to get one in Dallas at that time), so he cooked it in a huge, thin-walled dutch oven that did the trick. He would cook the rice, then scramble the egg, then cook the pork, and then chop all of the other vegetables.Then he would get to work cooking it all . As I said before, the end result was delicious, and certainly worth all of his effort as far as I was concerned. But whenever I thought about making it, I would remember the hours it seemed to me that my Dad spent in the kitchen preparing it, and more trouble than my effort was worth. I resigned myself to only eating it when I ate out or ordered in. Once again, Ching-He Huang on Chinese Food Made Easy came to my assistance. I watched her make a version of fried rice that took minutes and looked incredibly easy. Having been so successful with my recent other stir-fries, I decided it was time to tackle this. It was even easier than I thought it would be. After prepping all of the ingredients, which took all of 15 minutes, it took about 5 minutes to make. I suppose it helps that I am not using meat in this, but even if I ended up cooking meat it would only add a few more minutes. 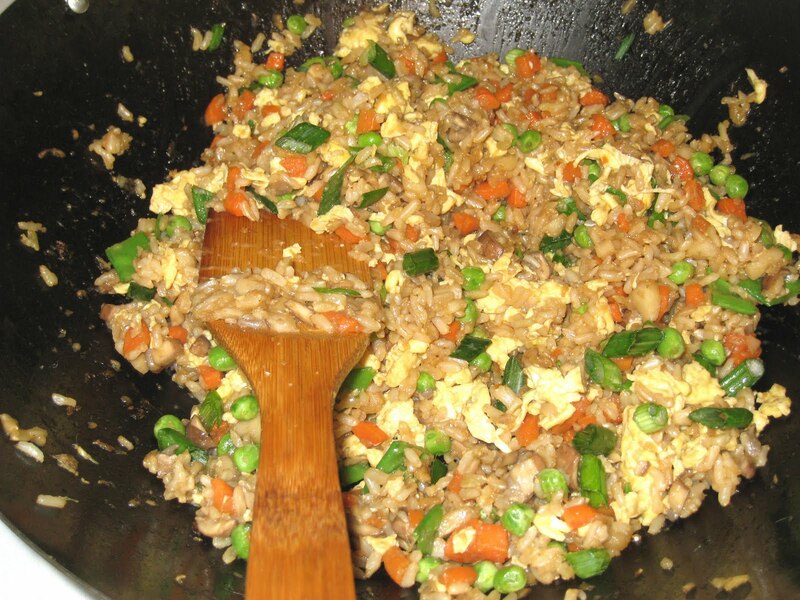 The most complicated aspect of making fried rice is that you really should cook the rice the day before, so the the rice can dry out a little and the grains won't stick together. But that is really no trouble at all. I just put the rice on after dinner the night before I want to make it and throw it into the refrigerator when it's done. There it is the next day, all ready for me. The joy of this dish, as is the case with so many others, is that you can use whatever vegetables you have on hand. Just keep in mind that the vegetables that take the longest to cook should go in first, and everything should be cut to the same size so it all cooks evenly. You can also add any meat or shrimp (which I would use all the time except for an unfortunate allergy). The possibilities are literally endless. I have already made this again, and plan to make it again this weekend. It comes together so quickly and makes such a lovely lunch, dinner, or snack that I want to have it around all of the time. Try it. You will, too. Heat the wok over high heat until it starts to smoke. Add 1 tablespoon of the peanut oil and swirl it around to let it get hot. Add the eggs and cook, stirring constantly with chop sticks to break them up. starts sticking to the bottom of the wok, add just enough water to deglaze the pan and then let the water evaporate before the next step. Add the mushrooms and cook for another minute. Add the water chestnuts and snow peas and cook for another minute, continuing to stir constantly. Add the rice and cook until it is heated through. Add the eggs back into the mix followed by the soy sauce and oyster sauce. Stir until well coated. Add the onions and sesame oil, stir, and remove from the heat. adapted from the Yangzhou Fried Rice recipe by Ching-He Huang on "Easy Chinese: San Francisco"